Syneron’s new ST applicator for non-invasive wrinkle treatment. Using the ST applicator, the ReFirme procedure offers patients a non-invasive, less painful alternative for skin tightening and wrinkle reduction on the neck, face and other areas. 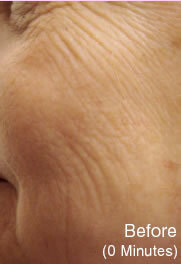 The ReFirme treatment with the ST applicator uses a pulse repetition rate of one pulse per second and uses Syneron’s elôs technology combination of Bi-Polar Radio Frequency and Light energies to precisely heat and stimulate collagen within connective tissue and tighten skin via wrinkle reduction. ReFirme is the safe, effective and non-invasive skin tightening procedure. . The lower energy level needed to power the ReFirm allows patients to be treated with less pain than is typically associated with skin tightening and wrinkle improvement treatments. To prepare for the treatment your skin should be thoroughly cleansed and dried, removing any makeup, creams, oils, topical anaesthetics or self-tanning products before laser treatment. The intended treatment area should not be exposed to sunlight or tanning booth light for seven days prior to treatment. Treatment is given every month. Any risks are minimal with this treatment and would be fully covered at the consultation stage .